Department of Biological Sciences, University of Texas at El Paso, El Paso, USA. Received June 16th, 2010; revised June 26th, 2010; accepted July 16th, 2010.
function can be induced by exposure to oil . In C. elegans, there are six SCs per germline nucleus. for the production of functional gametes. Crude Oil as “A complex combination of hydrocarbons”. N-Hexane, Isopentane, Pentane, and Stoddard Solvent. ported after exposure to oil . were determined using the Metamorphosis program . degradation of the nucleoplasm and protein matrix. structure may result in decreased viability and fecundity. five worms selected which were exposed to 50% oil. row) as in senescent worms. Bar equals 0.1 µm. zation, of the chromosomes and altered protein structure. three different concentrations by reconstruction of synaptonemal complexes. 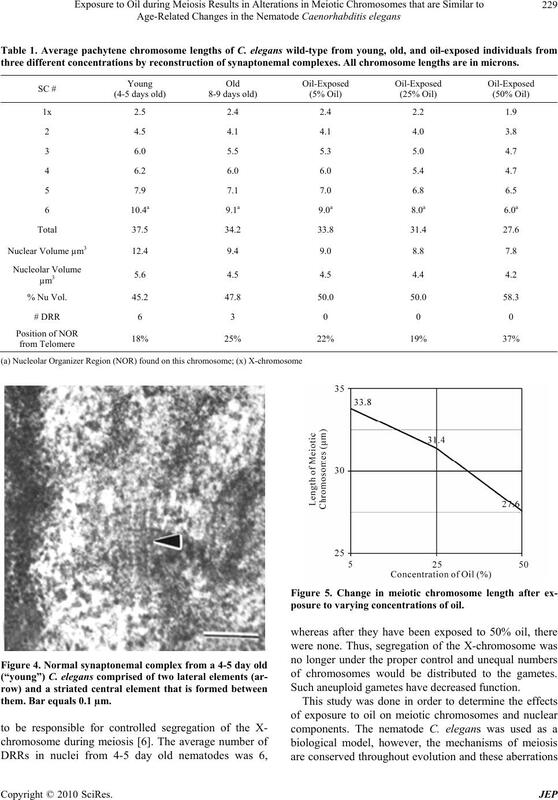 All chromosome lengths are in microns. them. Bar equals 0.1 µm. posure to varying concentrations of oil. of chromosomes would be distributed to the gametes. Such aneuploid gametes have decreased function. to varying concentrations of oil. may pertain to humans as well. National Center for Research Resources (NCRR)/NIH. official views of NIH or NIEHS. Plenum Press, NY, 1978, pp. 225-260. No. 3-4, 1982, pp. 223-229.
netics, Vol. 91, No. 1, 1979, pp. 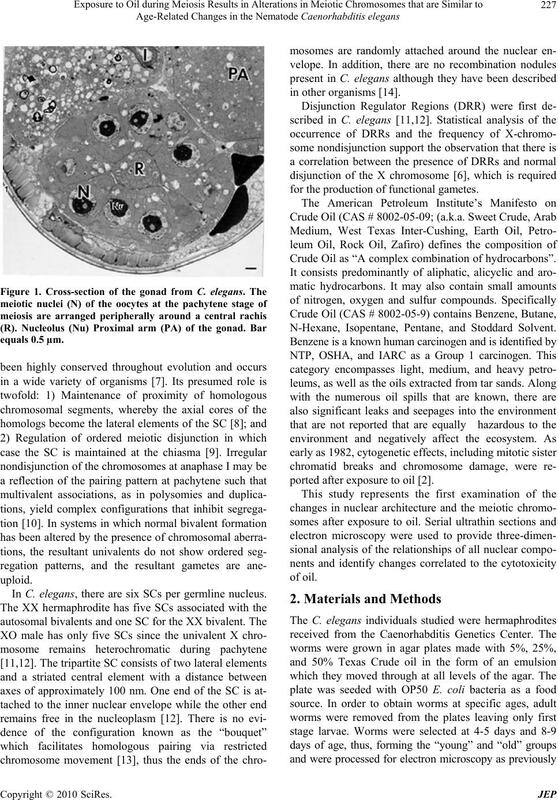 67-94.
orhabditis elegans,” Genetics, Vol. 96, No. 3, 1980, pp. the Nematode Caenorhabditis elegans,” In: B. Vig and A.
ology, Alan R. Liss, New York, 1987, pp. 189-204.
mosoma, Vol. 93, No. 2, 1985, pp.177-182. 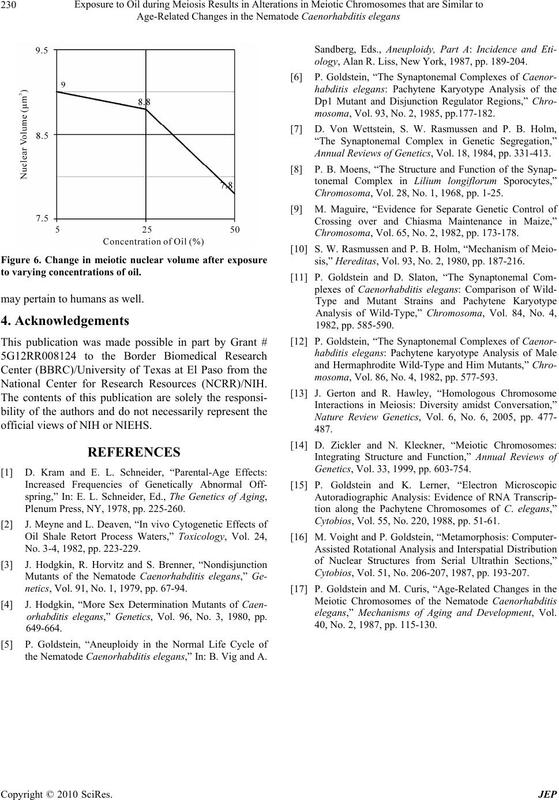 Annual Reviews of Genetics, Vol. 18, 1984, pp. 331-413. Chromosoma, Vol. 28, No. 1, 1968, pp. 1-25. Chromosoma, Vol. 65, No. 2, 1982, pp. 173-178.
sis,” Hereditas, Vol. 93, No. 2, 1980, pp. 187-216.
mosoma, Vol. 86, No. 4, 1982, pp. 577-593. Genetics, Vol. 33, 1999, pp. 603-754. 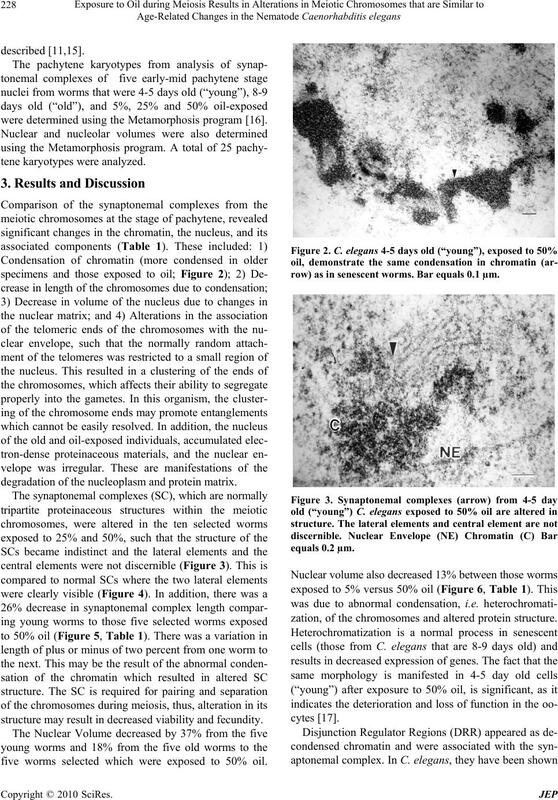 Cytobios, Vol. 55, No. 220, 1988, pp. 51-61. Cytobios, Vol. 51, No. 206-207, 1987, pp. 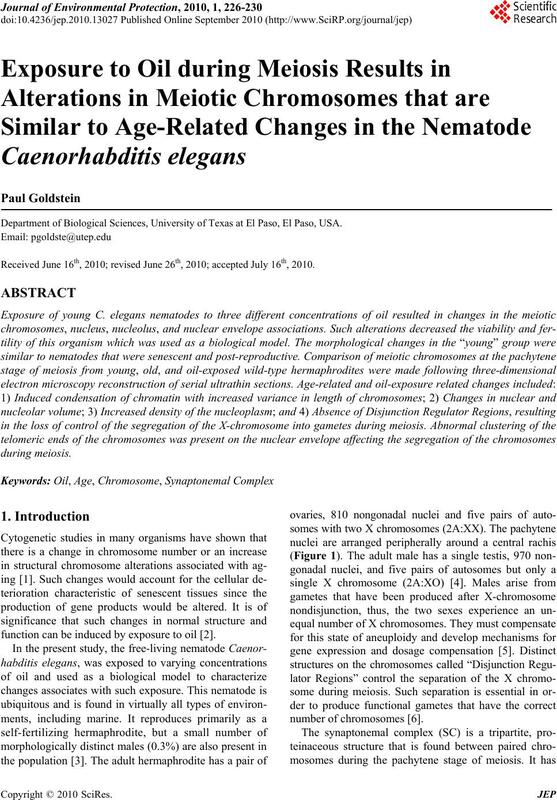 193-207.
elegans,” Mechanisms of Aging and Development, Vol. 40, No. 2, 1987, pp. 115-130.